Young adults are tech-savvy, politically independent, optimistic and racially diverse, according to new, comprehensive research about the millennial generation, currently ages 18-33. Knowing who millennials are is an incredible tool in helping reach them with the message of Jesus. 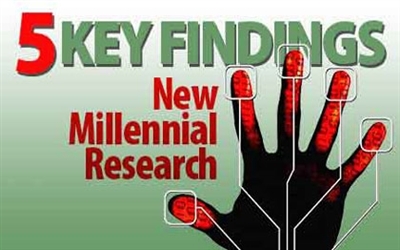 Let's dig into findings and discover how this new data can help you reach this generation. These individuals have grown up with the Internet in their pocket, social media in their friendships and selfies on their walls. None of this was an adaptation. That is simply how their world works. A full 81 percent of millennials are on Facebook, with a median number of friends at 250 compared to a median of between 50 and 98 friends among boomers. What does that mean for the church? We must learn to adapt a message spoken thousands of years ago to this new medium. Beyond having a presence on the Web and Facebook, we must engage there. We must have meaningful presence beyond "come to church at 11." Not doing so says we don't understand their world. Check out our Social Media Category for all you need in order to be an engaging presence in social media. Though they generally vote more democratically, half of millennials claim no political affiliation. They consider themselves independent and not nearly as patriotic as the older generations. What does this mean for the church? We must be very careful about how we engage with politics. In fact, an absence of political talk from any upfront personality is something most millennials will appreciate. This does not mean that they are not concerned with social issues. They simply choose to engage issues nonpolitically and do not like to label themselves with the more political terms like "environmentalist." Though they are only half as likely (19 percent as opposed to around 40 percent) to say that most people can be trusted, millennials are more likely to believe that the nation's best years lie ahead. This generation has grown up with primetime TV specials like "To Catch a Predator" and constant warnings to guard themselves against people who might be wolves in sheep's clothing. Despite that, they think things generally are looking up. This may be the most important insight of all from the church's perspective. In hopes of bringing healing and redemption, churches may focus more on sin and its negative impact on the world. However, to millennials, this sort of message lacks a ring of truth. To them, the world is not on the downslide. It is OK and going to get better as far as they are concerned. We must learn to capture the hope of the New Jerusalem and use it to talk about the brilliant future God has for us. Millennials are the most racially diverse U.S. generation in history. With more than 43 percent of this generation being non-white, the idea of an all-white anything doesn't make sense. Everywhere they turn among their peers, they see the diverse beauty of God's creation, which is a new normal that is changing the United States. In fact, if current trends continue, the majority of North Americans will be non-white by 2043. Though they may not expect to walk into your church and see a perfect representation of America's melting pot, when the leadership and platform are mono-racial, it says the church is not like the rest of their world. We have talked about looking at your platform and being more authentic, and it bears another read. One of the most intriguing pieces of data is a measure of the certainty of millennials' beliefs about God. While they are the largest group of any generation to say they do not believe (11 percent as opposed to 6 percent and 5 percent), among those that do believe, 32 percent are not certain. These traits of being willing to question and open to being wrong on very important ideas and beliefs are hallmarks of this generation. Millennials are comfortable with truly reflecting on their beliefs, knowing they could be wrong. This could be as big a cultural change in your church as any of the others. Our churches must be open to questioning. When we debate issues, we must recognize it. When we have questions about something we are discussing, we must share it. If we want to connect with this questioning generation, we must open ourselves and our sermons to this way of engaging with the world. If you want ideas on how to do that, check out these four sermon series to connect with millennials. * Jeremy Steele writes for United Methodist Communications' "MyCom." To read other articles with ministry ideas, visit www.UMC.org.